In Al Hakam (Urdu), 21-28 May 1918, we found an historic article written by the brother-in-law of Hazrat Mirza Ghulam Ahmadas, Hazrat Mir Muhammad Ismailra on the blessed memory of the Promised Messiahas. This was written for those individuals who were not able to physically meet the Promised Messiahas and was written as an alternative to the photographs of the Promised Messiahas. By the grace of God, Ahmadis are spread throughout India. In fact they are present throughout the world. But among them, there is a difference between those who have seen Ahmadas and those who have not. Those who were blessed to benefit from his noble presence possess a sense of serene pleasure in their heart which resonates with them to this day. Whereas those who were unable to see him are often found to lament this and regret their delay and the fact that they were not able to see the face of their beloved in his lifetime. There always remains a stark difference between a picture and the reality, something only those can relate to who saw the face of the Promised Messiahas with their own eyes. It is my earnest desire to describe the appearance and practices of Hazrat Ahmadas so that those who were not able to see this blessed individual might benefit from it. Instead of going into detail about the Promised Messiah’sas appearance, I deem it better to write more generally so that readers are able to draw their own conclusion. The appearance of the Promised Messiahas can be summarised in a single sentence: He was a perfect example of masculine beauty. But this statement is incomplete if another is not added to it: His humanly charm and beauty carried a spiritual glow and aura with it. As he was raised for the Ummah to manifest the beautiful and peaceful aspects of Islamic teachings, similarly his physical beauty was a manifestation of God’s omnipotence and would draw the heart of the observer towards him. His face, illumined with spirituality, never exhibited arrogance, haughtiness or the slightest pride, rather it always manifested love, humility and modesty. Once, the Promised Messiahas went to Dera Baba Nanak to see the cloak of Guru Baba Nanak. Upon his arrival a cloth was spread under a tree where they all sat. His arrival had brought people in from outlying villages, eager to see him and greet him. Unaware of whom the Promised Messiahas was, people started approaching Maulvi Syed Muhammad Ahsan Sahib and after shaking hands with him they would take a seat. After a while the reality was disclosed by Maulvi Syed Muhammad Ahsan Sahib who signaled towards the Promised Messiahas and revealed the reality upon everyone. A similar incident occurred when the Holy Prophetsa migrated to Medina. Even on that occasion people mistook Hazrat Abu Bakrra for the Holy Prophet Muhammadsa. To remove their misconception Hazrat Abu Bakrra took his cloth and shaded the Holy Prophetsa and hence corrected the mistake. The Promised Messiahas was neither thin nor stout. He was of stocky build and of average height. Although his height was not measured, it was around five feet, eight inches. His shoulder blades were spaced apart and to his last age he did not lose posture. All parts of his body were perfectly proportioned. Neither his hands nor legs nor stomach were out of proportion. Hence no unpleasant features were to be witnessed in his body parts. His skin was neither soft as of women nor rough. His body was strong-jointed and possessed the toughness of the youth. In his last years his skin neither wrinkled nor withered. He had a striking ruddy complexion. It possessed the aura and grandeur of spirituality. This was a permanent spectacle. His colour never faded in times of hardships and trials rather it would shine like bright gold. No hardship or difficulty was able to wither it away. Apart from this aura his countenance was always brimming with a delight and a permanent smile on his face. An observer would remark: If he is false in his claim and aware of his lies then why does his face always manifest the signs of triumph, happiness, delight and serenity? Such faithful manifestations can never be attributed to a wicked person and the light of faith can never shine on the face of a wrongdoer. “God has informed me that Atham has turned to the truth, so the All-knowing God has allowed him a respite.” Those who were listening saw his contended face and believed him to be true. They contemplated upon the fact that they were being devoured by hopelessness and here he was standing in front of them, jubilant with satisfaction on his face and talking without any signs of dismay, rather with utmost delight. It seemed as if God had appointed him to judge the matter of Atham. And upon witnessing Atham’s renouncement from his denunciation of Islam and observing his restlessness, Hazrat Ahmadas allowed Atham respite from death. And now he was delighted as if a victorious wrestler out of his beneficence and mercy had forgiven his opponent, considering it an insult to kill someone who was already moribund. The prophecy about Lekhram was later fulfilled according to its terms and conditions. The foulmouthed started to raise false accusations. A police report was filed to investigate Ahmadas. The Police Superintendent arrived with a force of constables to search his house. The movement of everyone in the house was restricted. The acrimonious opposition was eager to find a single doubtful word that could be found in his correspondence or documents to prove him a culprit. But there he was, standing with full contentment and serenity. He himself would provide all documents, books, bags and letters in the house to the police to assist them in their inquiry and showed them all around the storerooms. Some of the letters that required a second look were taken into custody but nothing changed for Ahmadas. His face still shone like the full moon and manifested utter contentment and jubilancy. It was as if the investigation had further cemented the proof of a manifest victory and established his sheer innocence in this regard. And then there were those outside the house, terrified and silent as they witnessed constables coming in and out of his house. Their faces had grown pale, unaware of the fact that the person for whom they were worried was himself calling upon constables to search his documents and letters. Ahmad’sas face conveyed a delightful cheer revealing that now the time had ripened and the truthfulness of his prophecy would be revealed in its complete terms and he would be proven innocent from all false claims made against him. Hence in all trials and tribulations his courage was singular, calm and imperturbable. Not for a single moment did he act out of spite and this caused many pure souls to accept the truth. His hairs were straight, shiny and silky and were kept dyed with henna. They were not thick or abundant. He would never have his head shaved nor would he have it cut too short. His hairs would reach up to his neck. He would oil his hair with jasmine oil and henna and this was a constant practice. He had a full, dense, striking beard on all sides with thick, straight and shiny hair, dyed with henna. The length of his beard would always be the size of a fist and he would have a regular cut to keep it straight and equally spread downwards. It was neither sparse nor dense. It was always oiled. Once due to the appearance of a small pustule on the cheek he had his hairs completely removed from that particular spot. Those hairs are still in the custody of his companions. The hairs of his beard were neither scarce nor so dense as to continue up to his eyes. Earlier he would dye his hairs with hair dye and henna. But later due to constant severe headaches he would dye his hair with henna only. For some days he also tried manufactured hair dye but later ceased its use. In his last days one of his companions Mir Hamid Shah prepared a hair dye for him that he also used. It blackened the beard but as for his lifetime routine he would dye his hairs with henna. He would have this applied by a hairdresser every Friday. As was his beard, so were the hairs of his moustache also thick, strong and shiny. 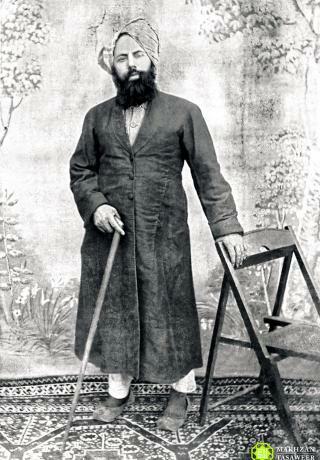 He was in practice of trimming his moustache close to the upper lip but not like the Ahl-e-Hadith custom of completely shaving off the moustache. He was not hirsute. His back was hairless. Sometimes he would trim the hairs on his chest and stomach. A thin and soft lining of hair covered his shin and the back of his hands. He had a narrow, straight face. Even in his seventies there were no wrinkles, nor were there any frown lines as are visible on the forehead of short tempered people. Observers would always witness contentment, serenity and a hidden smile on his face. THe colour of his eyes was black. He would always keep his gaze lowered in accordance with the Quranic injunction. During discourses he would keep his gaze lowered even when addressing a gathering. Even at home, his looks would be restrained and he would not immediately notice all in attendance. It is also important to mention that he never used eyeglasses. His eyes would never get tired due to the overload of work. God promised to safeguard his sight and hence it remained unaffected until his death. Yet he was not able to witness the new moon with the naked eye. His nose possessed the traits of nobility; slim, straight, high and perfectly proportioned. Is there anyone who can tell me that about a Messhiah in Al Quran? This verse is heralding the advent of a testifier who shall be amongst the followers of the holy Prophet (Peace and Blessings of Allah be upon him) and he shall witness the truthfulness of the holy Prophet (Peace and Blessings of Allah upon him) at such time when it is made suspicious and doubtful. It is obvious that only that witness can be accepted who has pure character and has observed the incidence to be witnessed with his own eyes. The Promised Messiah (Peace be upon him) was raised in such age when Islam was either forsaken or corrupted. Huzoor challenged the followers and scholars of all religions to present such irrefutable evidence as he claimed to have presented for Islam, i.e., heavenly signs and live communication with God. Nobody dared to accept this challenge and thus proved the authenticity of Islam. In this verse the advent of a prophet has been heralded whose name shall be Ahmad. It is said that holy Prophet (Peace and Blessings of Allah be upon him) is mentioned in this verse. This interpretation is acceptable but it should be kept in mind that his name was Muhammad, not Ahmad. This verse is from Sura Juma which is very next chapter after Sura Saff wherein the prophecy about a prophet named Ahmad is mentioned. Now in this chapter it is mentioned that first appearance of that prophet has taken place in Makka amongst the unlettered people and his second appearance shall be in latter days amongst another people who haven�t so far met him. At the revelation of this verse Hadhrat Abu Huraira (RA) asked the holy Prophet (Peace and Blessings of Allah be upon him) that who shall be these people amongst whom this second appearance of the prophet shall take place, upon which he put his hand on the shoulder of Hadhrat Salman of Persia, one of his companions, and said that if faith ascends to the highest star, one man or some men from his people shall bring it back to the earth. As the Promised Messiah (peace be upon him) was from the Persian people, this prophecy is fulfilled in his person. In this verse of Chapter �The Pen�, Allah has presented pen and writing by it as the testimony to the effect that the holy Prophet (Peace and Blessings of Allah be upon him) has no mental illness. It means that there shall come a time when such writings shall appear wherein it shall be alleged that the holy Prophet (Peace and Blessings of Allah be upon him) was God forbid mentally sick, but these allegations and accusations shall be rebutted by pen and it shall be proved that all these allegations are bundle of lies. By the Grace of Allah, the Promised Messiah (Peace be upon him) wrote thousands of pages proving the high standard and truthfulness of the holy Prophet (Peace and Blessings of Allah be upon him). In these verses, 12 revivalists of Muslim Ummah have been mentioned as mansions of heavens who appeared in the beginning of every century. Then the promised day has been mentioned in which the testifier, i.e., the Promised Messiah (peace be upon him) appeared and testified the truthfulness of the holy Prophet (Peace and Blessings of Allah be upon him). The appearance of this testifier is also mentioned in Chapter �Hud�. IS IMAM MAHDI MENTIONED IN THE QURAN? Some people argue that there is no mention, whatsoever, of Imam Mahdi in the Holy Quran. They demand us to prove from the Quran that Imam Mahdi shall come. We have already proved from the Quran that prophet-hood is continued. In the following verses we�ll prove that Imam Mahdi, which means �a guided leader�, is a title of the prophets and all the prophets have been called Imam Mahdi. The confusion arises in the minds when people think of Imam Mahdi as a separate and distinct personality from the Promised Messiah. In the Ahadees of Hadhrat Muhammad (Peace and Blessings of Allah be upon him) mentioned in Ibn-e-Majja and Musnad Ahmad bin Hanbal, Imam Mahdi and the Promised Messiah has been mentioned as one and the same person. The holy Quran also does not differentiate Imam Mahdi from prophets and call the prophets as Imam Mahdi, as is evident in the following verses. In this verse Allah gives this glad tiding to Abraham that He is making him the Imam, which means that prophet and Imam are only two different names for one office. In the verses 72 & 73 of Al-Anbiya, Allah mentions Prophet Lot, Ishaq and Yaqoob and then in verse-74 calls them Imam Mahdi. Similarly in the following verse, Allah also mentions the Prophets of Israelites as Imam Mahdi.